Our system produces 3 different reports. The first report is called a "Life Resource Survey Report." The second report is called a "Retirement Planning Survey Report." The third report is called a "Life Resource Analysis Report." In this article we will discuss how to present a Life Resource Survey Report." In Article #16 we will discuss how to present a Retirement Planning Survey Report. And in Article #17 we will discuss the way that you produce a Life Resource Analysis and how to present the report from it. Presenting your Life Resource Survey in a professional manner with supporting learning resource documents in a binder or in a professional looking cover will greatly enhance your relationship with your planning clients. We call these supporting documents "learning pieces." Most of our new life resource planners ask the question, "Why should there be so much?" Meaning, why should there be over 65 pages of planning pages and learning pieces in one option or 210 pages inserted into a three ring binder in another option? Would it not be much better to provide less information and not overwhelm the client? Besides, the client will never read or even understand all of this material. Our purpose is deliberate. We have learned it over many years doing this kind of planning. None of the learning piece material we provide is irrelevant, and if the client or the client's children really wanted to read it all – which some actually do – it provides valuable information. But that is not our primary purpose. We want the client to believe that we have devoted a great amount of time and effort into producing this planning report with its learning pieces and that it is unique to our client. This is basic psychology. The more valuable it looks to the client, the more likely a client will develop trust in you. And this trust carries over to the recommendations that you make. The more impressed the client is, the more likely he or she will implement your recommendations. The first option below would be the least expensive for you to put together in a presentation report. A presentation cover that has a three hole retainer in it and separation tabs for the three separate sections of your report might cost around $3.00 to $5.00. The printed materials comprise approximately 65 pages. Five or six of the pages require color printing, but the remainder are black and white reproductions. Printing or copying the printed materials might cost you an additional $5.00 to $6.00. If you are not charging a planning fee, you may ask your clients to reimburse you for your time and your materials to present the report. Perhaps $50.00 or $75.00. Obviously your time is worth more, but by charging, you avoid creating suspicion in their minds that you have ulterior motives since you are obviously incurring some costs and they will quietly question why you are doing it without pay. See Article #14 for more details on this assembly process. This second option below represents more cost for your report presentation. The binder and tabs might cost you about $8.00 to $10.00 and the printing costs for approximately 210 pages of presentation documentation might cost an additional $14.00 to $16.00. Again, if you choose not to charge a fee for this enhanced presentation, you might choose to ask your clients to pay you for the cost of materials and your time to allay any suspicions that you have ulterior motives. Perhaps $90.00 to $100.00. See Article #14 for more details on this assembly process. A typical report might include 10 to 15 different recommendations and strategies for discussion. This is certainly an overwhelming number to handle and could be confusing to your clients. We want to point out that these recommendations and strategies are really parts of certain key categories. There are only 5 of these key categories. You want to point this out to your clients as well. By doing it this way, you can concentrate on a few of the issues that need to be addressed in each category and leave some of the other issues for a later time. We discuss below creating a checklist to address the most important issues. This is also an important strategy for getting them to implement your solutions. 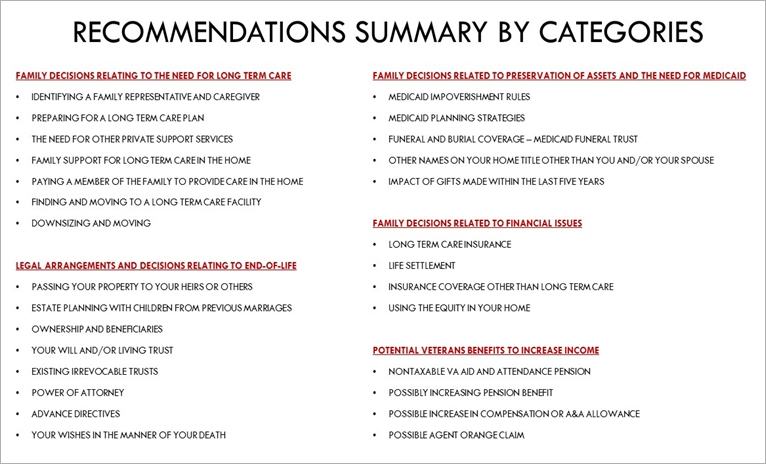 Here are all of the 29 issues that can be addressed in a Life Resource Survey and the categories that they fit into. Most of the aging senior clients for which you will be producing reports will have a need for long term care services or as it’s commonly called, eldercare. In many cases, families have conflicting ideas on how to take care of their loved ones. With this planning approach, you are primarily dealing with children of the aging seniors or with younger family members. This particular learning piece is extremely valuable in helping children or other family members get together and determine together how they will handle decisions relating to eldercare for their loved ones. The Learning Piece – "Government Solutions for Eldercare"
In order to save you money in putting together a report presentation, we provide you this condensed document that is an excerpt from the larger document titled "Understanding the Fundamentals of Life Resource Planning" that we discuss below. Ideally you should put together a presentation with the larger learning piece and not use this condensed version. However, we give you this option if you strongly feel that you do not want to spend the money on a larger and more comprehensive report binder. We discuss this idea in more detail in Article #14. We also employ a unique approach to making the recommended solutions. It is our experience that most planners not using our system summarize their recommendations or strategies on a single page or two in the form of an outline or a checklist. Our approach is a little different. A typical life resource questionnaire might result in 10 or 15 recommendations or strategies. The recommendations are also presented as paragraphs that not only provide a possible course of action but also include education on why they should take that course of action. Please understand that we only make recommendations that as a result of the questionnaire, apply to the client in some way. This recommendation solution strategy is also basic psychology. By giving them a number of choices, they can pick out those ones they feel are important. The concept here is to impress upon your clients that given a list of various choices, they must make some decision as to which of those choices they should take. It forces them to make decisions as they know they cannot reject everything you give them. This planning process allows them to make the decisions themselves instead of your trying to make those decisions for them. This strategy also makes them personally involved in the planning and creates more trust in your recommendations. Instead of your dictating to them, they are cooperating in the outcome. The end result of this strategy is that they will almost always follow a certain number – but not all of – the presentation recommendations and feel good about it.